The four-story granite jail was built by the J. Pauly Jail Building and Manufacturing Co. of St. Louis who constructed many jails throughout the U.S. The granite exterior was quarried locally and the iron bars for the cells and windows were transported by rail from St. Louis and were assembled on site. The central tower housed the gallows. In 1982, the jail was condemned and in 2002 the county built a new jailhouse. The City of Llano purchased the jail from the County in 2005 to help with the restoration of the Llano County Courthouse. The jail suffers from poor drainage and the settling of the foundation has created large cracks in the walls. The east and west gables are falling away from the central tower. Many of the windows are in disrepair which allows rain and animals to enter the building, creating further damage. A nonprofit organization, the Friends of the Llano Red Top Jail, was formed to assist the City with the preservation of the jail. As many local governments opt for demolition to encourage new development, it is encouraging to see the community and the city partnering to preserve this historic building. However, the financial need is great and the maintenance of this massive granite building is a huge burden for any community. UPDATE: In 2015, the Friends of the Llano Red Top Jail took possession of the site from the city of Llano. Restoration work, including foundation repairs were completed. 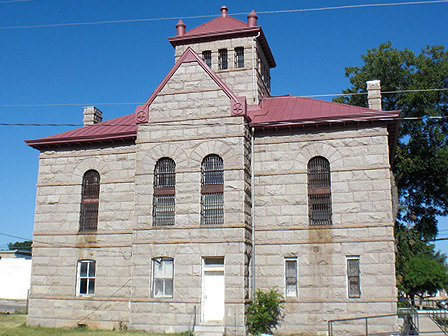 The Llano Red Top Jail Museum is scheduled to open in 2016.